By Sara Essop, published 9 October 2013. Amazement. That was my first reaction when I got to Mount Amanzi. The place was busier than Hyperama on a Heyday. It was 4pm on a Friday afternoon and the car park was full of people arriving. We asked the security guard if it was like that every Friday and he said that it was busier that particular day because of the school holidays. My second thought was that if they were so busy they must be doing something right. I looked forward to see what was on offer. Check-in was a lengthy 2-step procedure due to the huge number of arrivals. First, one had to complete an indemnity form and everyone in the party had to fill in their ID numbers and sign the form. Children had to be signed for. Then one had to wait in a long queue to reach reception with the indemnity form, booking reference and refundable deposit (payable by credit card) before being given the keys, the map and the weekend activity guide. However, the long process was made more bearable by the free juice, popcorn and Nescafe machine offerings. My children were happy to sample these while I waited in the queue – and gave it their stamp of approval. Mount Amanzi is a short drive away from Johannesburg and Pretoria and is nestled along the banks of the Crocodile River. 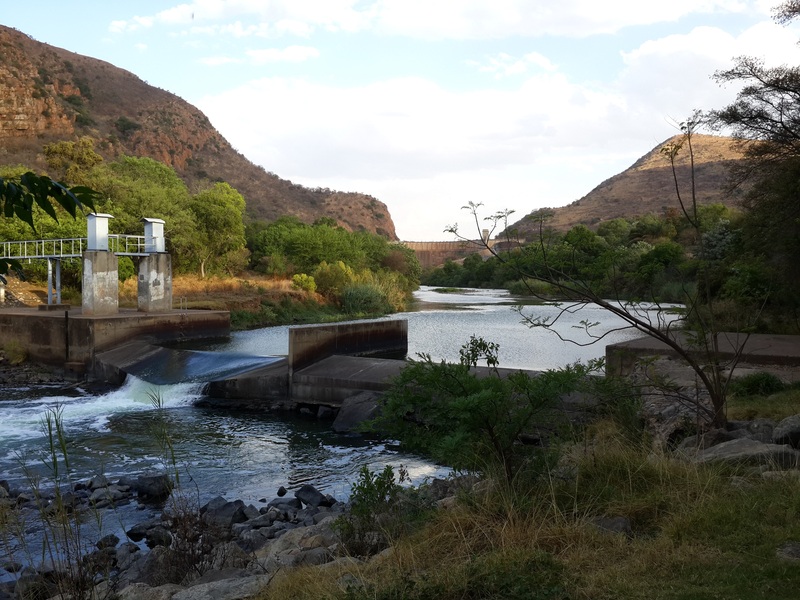 It has the picturesque Magaliesberg Mountains as a backdrop and is close to the Hartbeespoort Dam. One can take a short walk along the river banks and see the dam in all its splendour. The scenic location made for beautiful photos. The resort has 166 chalets. There are 8-sleepers, 6-sleepers and 5-sleepers. We stayed in the latter. If you're a fan of the open plan style, then you will like these chalets. Personally, I prefer closed-off rooms with some doors for privacy control. The bottom section consists of an open plan bedroom, lounge and dining area with TV, fully equipped kitchen area and a bathroom. There are stairs leading up to a neat loft with 3 single beds in it. The chalets are neat and clean and have been recently renovated. Each chalet has an outdoor patio with braai facilities. The facilities are the biggest drawcard here. There were many regulars at the resort. Everyone I spoke to told me that they came there often because of the heated pool, a huge natural-looking pool built into a cave like structure. This pool was always busy while we were there but I imagine that it must be even more enjoyable in an off-peak period. There are other pools as well but they are cold. The resort also has tennis, volleyball and putt-putt facilities, as well as a laundromat, a convenience store and a restaurant. Fishermen can indulge in fishing. There is a small gym and a small beauty salon that offers massages as well. In busy periods, there is an organised kids program with arts and crafts activities like bookmark-making, beading and and movie nights. We also saw a fascinating live snake show one morning. We stayed here for 3 nights but I could easily spend a week. It is so near to the city but you feel as though you’re far, far away because of the mountains, and the river. You can have a relaxing holiday without driving too far and get back feeling rejuvenated.